For my birthday this week my husband took me to my favorite place, the beach! The weather was fabulous and our time away was so relaxing. My only gripe was that we had to go home all too soon. so, of course, I had them by the sea while we were there. The beauty that God created nourishes my spirit while His word cleanses, renews and refreshes my soul. There's nothing like looking at the sea to remind me that God is in control and that He is strong enough and capable enough to take care of me, my life and my circumstances. The verse I used in the photo is one I read in my devotions. Just think, that powerful, majestic Voice spoke that sea into existence! Love your photo. He is "living" water. Beautiful picture and what a majestic verse you paired it with. So happy you were able to spend a few days enjoying God's creation. Beautiful!! picture... you can almost hear HIM in that wave!! Beautiful photo, amazing color. You picked the perfect verse to go with it. Happy Birthday! Not only did He bring the great oceans into existence...but YOU as well! That is a marvelous photograph couples with powerful verse! Cheers ... visiting from Freshly Brewed Sunday! Wow. That's all there is to say. Just wow. The beach is one of my favorite places, too. Happy birthday! 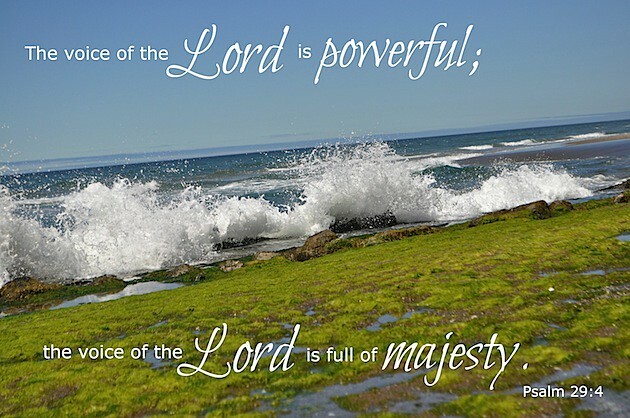 That picture beautifully captures God's power and majesty. Love the beaches, too. When I'm in your area towards the end of October, I'm hoping the weather will allow me to walk and walk at Cannon Beach or a couple of the others that I always have on my heart. Always fills my heart with true joy. Glad you had such a blessed time, such a treat. AH ... HOW GORGEOUS! I just LOVE THIS! Yes, God is in control and working even when it doesn't seem like our needs are on his radar screen. Thanks for the reminder and encouragement. And a very Happy Birthday!! I love the ocean, too. The waves crashing like the ones you've captured here remind me of His majesty, His power. Then the gentle lapping of the sand, back and forth, brings a peaceful steady rhythm to my heart. And there I am to Worship! I love sitting on the beach and listening to the waves crashing. God is so majestic and powerful! It's been awhile since I've been by, Elizabeth. It's good to be back, and Happy Birthday!! Sounds like you had a wonderful time! I love your image and verse ... it's also been quite awhile since I've seen the ocean! This is so beautiful! Your words here have so encouraged me, especially ... "The beauty that God created nourishes my spirit while His word cleanses, renews and refreshes my soul." So very true!! He creates beauty in our own lives as we meditate on His Word! Thank you for sharing! I also want to thank you for coming by and leaving that sweet message on the photo I shared with S&S! You have a blessed week! I love LOVE the beach, my favorite place to relax. We were there yesterday. Good words with ocean, the waves powerful and majestic. Happy Birthday!!! I agree what better place to enjoy your devotions then right in the midst of all things God spoke into existence. Sooo powerful and full of awestruck wonder!! Beautiful pairing of verse and photo.